Roses are famous for their heady fragrance and showy blooms. But these prized and historic plants are cultivated for other ornamental qualities as well, including the color of their canes, the size and shape of their prickles, and most notably, the wide diversity of their hips. Hips appear in many shapes, colors, and textures—there are as many variations in hips as there are in roses. The hip (also referred to as a hep or haw) is the fruit of a rose, and, like all fruit, it develops after the fertilization of the flower occurs. When the flower is spared from deadheading, many small seeds—called achenes by botanists—grow inside, and the hip swells. As the season progresses and these seeds mature, a fleshy layer called the pericarp develops around them. 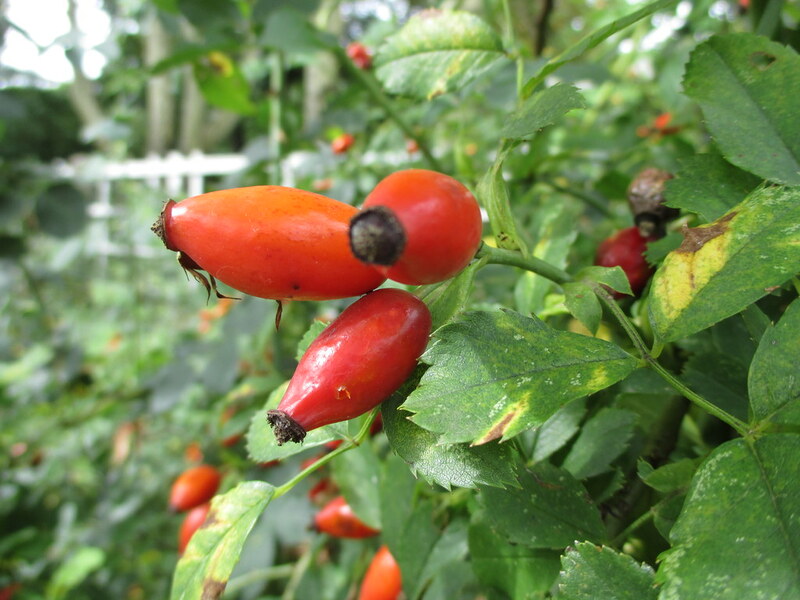 The pericarp is high in vitamin C and natural sugars, which is why rose hips are used both medicinally and in culinary creations such as teas and jams. In terms of shape, they may be globose, ellipsoid, obovate, pear-shaped, or bottle- or flask-like, and they vary greatly in size. You may spot some that look like tomatoes or large crabapples. Others are quite small and appear in clusters. Some have smooth and polished-looking skin, others are dull and thorny. Many have resinous hairs called trichomes. Rose hips have an impressive range of color that will become even more evident as September unfolds. Look for hips in bright orange, red, burgundy, and iridescent purplish black. 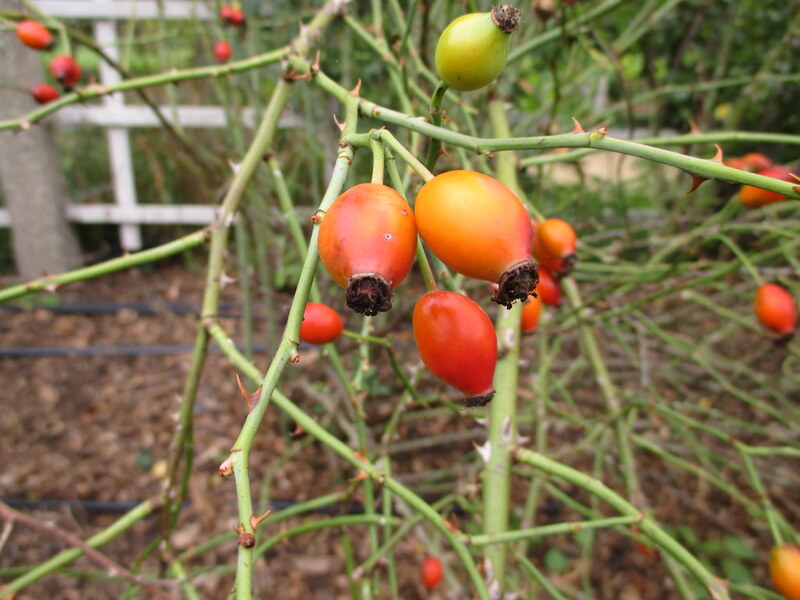 Many gardeners think of these distinctive fruits as a fall bonus from their single-blooming roses. Repeat-blooming roses, which are typically deadheaded throughout the summer, can also be left with their hips on toward the end of September and into October as a way of signaling to the plant that it is time to consider dormancy. As the days begin to shorten and the nights become cooler, the hips will take on a noticeable color change, going from green to deep shades of orange. Some hips will persist into winter, providing a nutritious food source for wildlife, including birds and squirrels. 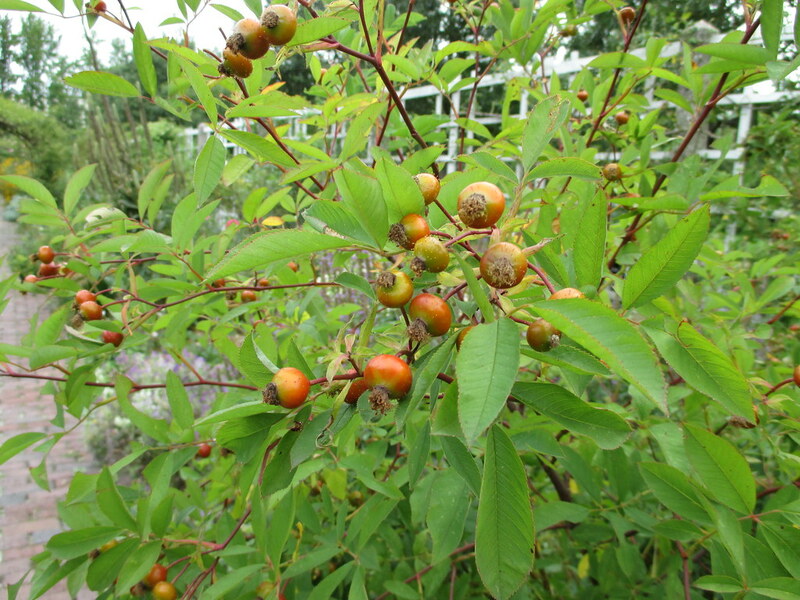 Other decorative hips, such as Rosa x micrugosa’s spiky gothic-looking ones will drop later in the fall. 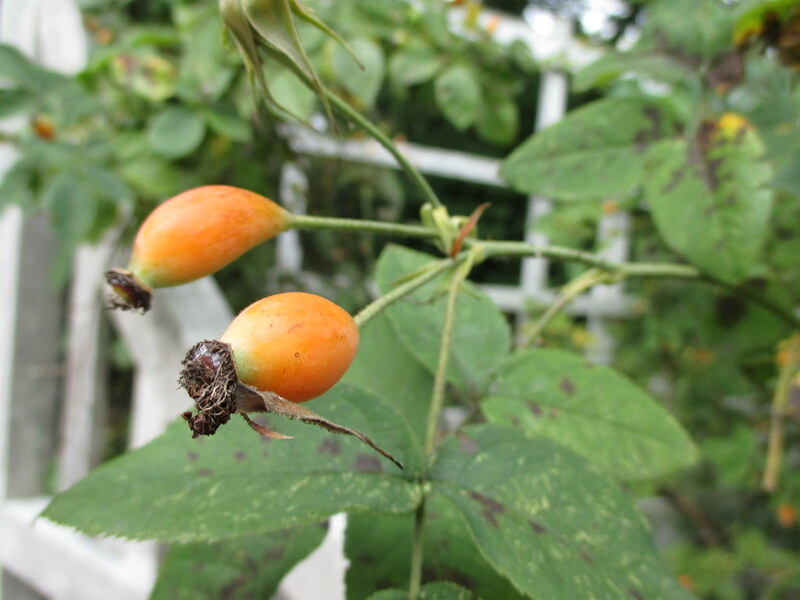 So be sure to look for rose hips in the Cranford Rose Garden and elsewhere for the next month or two. This is the time to see them their full glory! 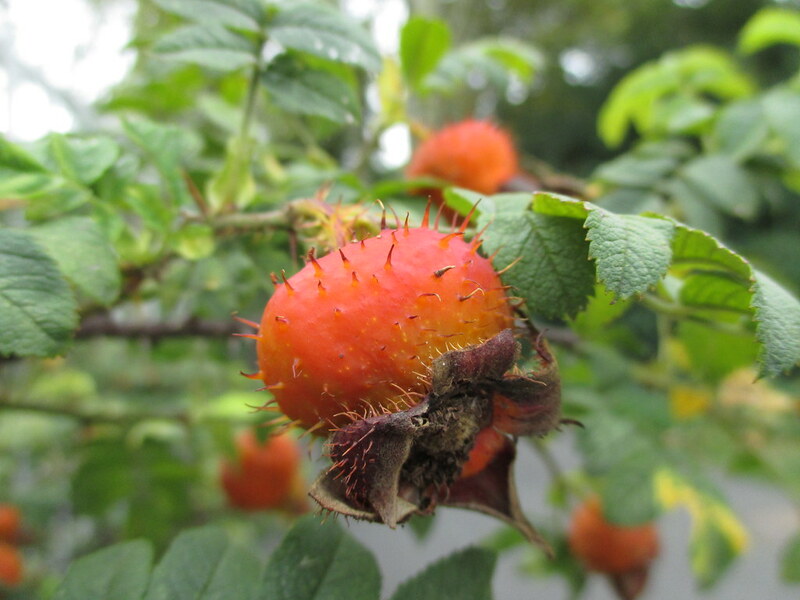 Rosa laxa, a species rose, produces shiny, red elliptic hips. Photo by Sarah Schmidt. 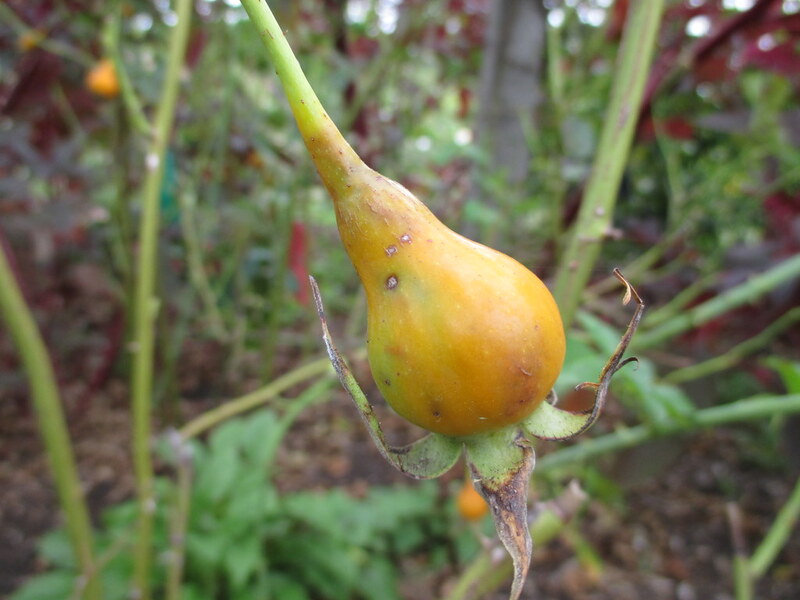 Some roses, like the 'Thomas Affleck' rose, produce rose hips that are shaped like upside down pears. Photo by Sarah Schmidt. 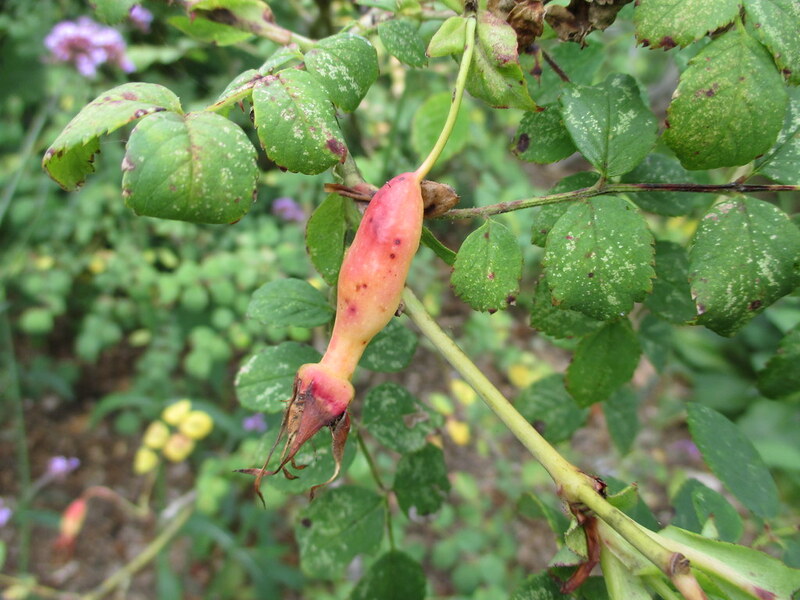 The hips and the foliage of Rosa palustris (swamp rose) will redden as fall progresses. Photo by Sarah Schmidt. Rosa setipoda hips are bottle-shaped. Photo by Sarah Schmidt. Many rose hips, like those of Rosa x micrugosa have resinous, glandular hairs called trichomes which help prevent water loss. Photo by Sarah Schmidt. Snow-bush rose (Rosa dupintii) hips will deepen in color and persist through the winter, becoming food for squirrels and other wildlife. Photo by Sarah Schmidt.